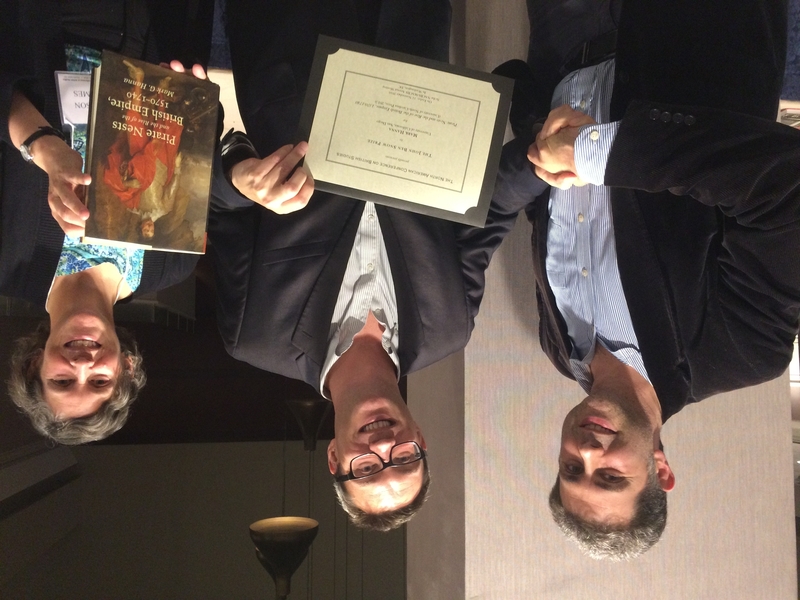 Mark Hanna recently received the prestigious John Ben Snow Book Prize for best book on British Studies before 1800 from North American Conference on British Studies for his book Pirate Nests and the Rise of the British Empire, 1570-1740 (UNC Press, 2015). Pirate Nests previously won the prestigious Frederick Jackson Turner Award from the Organization of American Historians, given to the author of the best first scholarly book dealing with some aspect of American history as a well as the John Lyman Book Award, Honorable Mention, for U.S. Maritime History from The North American Society of Oceanic History. Hanna pictured with Snow Prize committee members Phil Stern of Duke and Alison Games of Georgetown.